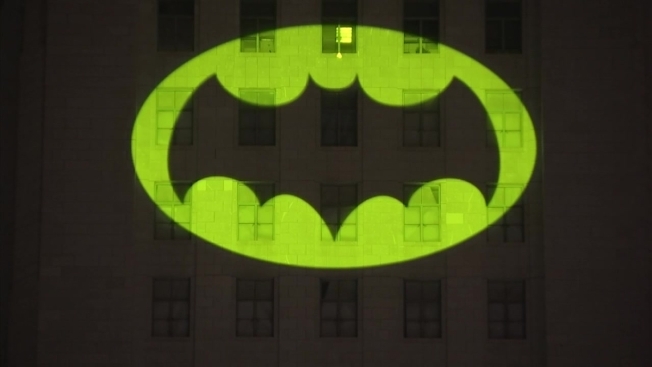 Los Angeles became Gotham City Thursday night as the Bat-Signal glowed at City Hall in honor of late Batman actor Adam West. Hundreds of fans, some in costume, cheered as Mayor Eric Garcetti and Police Chief Charlie Beck switched on the iconic signal and splashed a yellow oval with a bat silhouette high up on the wall of City Hall. West, who played the Caped Crusader in the campy 1960s TV series, died last week at 88. "Like you, we all spent many hours in front of the TV, same bat time, same bat channel," Garcetti told the crowd. "Adam West taught us each one of us had a heart of gold," Garcetti said. "There will never be another Batman like Adam West and there will never be another Adam West." The mayor also led the citizens in a rendition of the TV show theme song, which consisted of playfully singing "nah-nah, nah-nah, nah-nah, nah-nah" to imitate the driving rhythm. On display was a red Bat-Phone like the one Gotham City's Commissioner James Gordon used to chat with Batman in the TV series. West's wife and children attended the event, Garcetti said. Burt Ward, who played Robin on the show, called the actor a "family man." "He loved humanity. He loved his fans," he said. Before the lighting, people lined up to take photos with two red-and-black, sharp-finned Batmobiles parked on the sidewalk. Some wore Batman masks and others wore capes, T-shirts and hats adorned with the Batman TV logo. Katie Aiani said she had idolized West. "I grew up watching him," the 29-year-old said. "It was my childhood." "He's a legend," said Chad Evatt, a 30-year-old costume designer who made a Riddler costume to wear to the event. "For the longest time he was the only Batman and that's a position that commands respect." Justin Harrison, 43, wore a Batman costume and said West was not only an actor but someone who "inspired millions."